Federal Land Inc., the real estate arm of Metrobank, will soon unveil another condominium project that will forever change the Don Chino Roces Avenue landscape. The life you always wanted starts here at Paseo de Roces. Paseo de Roces will join the two other iconic projects of Federal Land along Don Chino Roces Avenue – Oriental Garden Makati and The Oriental Place. Also, not far from Paseo de Roces is the most luxurious real estate development in Federal in Makati, The Grand Midori. Your new home at Paseo de Roces is accessible to all types of commercial establishments and major point of interest including Makati Medical Center, Waltermart, Makati Cinema Square, Don Bosco Technical Institute, and St. John Bosco Parish Church. Not to mention it is close to major thoroughfares such as Gil Puyat Avenue, Pasay Road, South Super Highway and Ayala Avenue. Paseo de Roces is geared towards single professionals, starter couple and mobile family that enjoys the urban lifestyle and wanted to live closer to work. Paseo de Roces offers Studio, 1- and 2-bedroom with area ranging from 25.5 sq.m. To 74.5 sq.m. Price starts at P2.3 million and financing starts at P8,000 per month. In addition to residential units, Paseo de Roces will feature Home, Office, Business and Shopping space (HOBS) units. 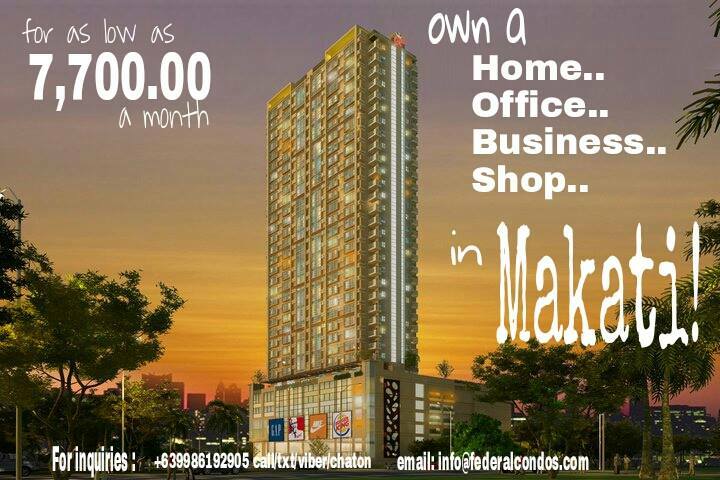 For small business owner, doctor, dentist, lawyer and other professional, you can now own a piece a real estate in a well-accessible area of Makati City. Your HOBS is telephone, internet and cable ready. 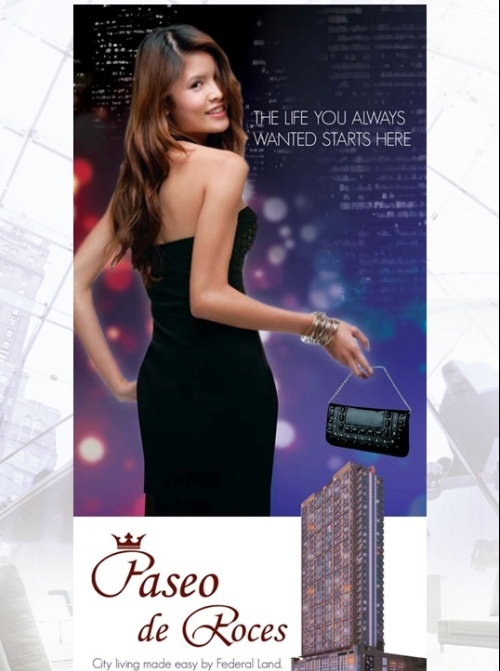 If you are an investor, Paseo de Roces is is consider a great investment as the area offers superb leasing potentials. For the first 50 buyers, Paseo de Roces is offering 4% promotion discount to kick-start the launching of this new Makati real estate project. Also, if you have cash to spare, 15% off unit price is offered to cash buyers. Don’t worry if you live on a budget, the affordable P8,000 monthly payment will sure fit your finance situation. As with other Federal Land projects, Paseo de Roces comes loaded with first-class amenities including adult/kiddie swimming pool, multi-purpose function room, fitness center, outdoor fitness station, day care, reflecting pond, kids’ center, outdoor children’s play area, meditation garden, conference room, reflexology walk, business center, open gazebo/cabana, game room. Ipad room, jogging path, and landscaped garden area. Federal Land Inc. has developed various projects including master-planned condominium communities, office buildings, an event venue, retail and entertainment centers and a hotel. Federal Land was awarded the prestigious Developer of Year in 2007 by the Chamber of Real Estate Builders Associations (CREBA). With a solid track record backed by three decade of experience and industry admiration, Federal Land’s condominiums surely makes a sound investment. Now finally, you can enjoy the life you always wanted. Come live at Paseo de Roces. For more information about this project and for other Federal Land Inc. project, please visit www.PaseoDeRoces.com or www.FederalCondos.com. Image | This entry was posted in Makati and tagged federal land condominium, federal land inc., federal lang philippines, federal properties, makati condo, makati condominium, makati real estate, manila condominium, manila real estate, paseo de roces, paseo de roces makati, paseo de roces pasong tamo, pasong tama real estate, pasong tamo condo, philippine real estate, philippine retirement property, real estate Philippines. Bookmark the permalink.